Recipes - Entrees - ROASTED CHICKEN/SUN DRIED TOMATO BASIL PESTO - Salado Olive Oil Co.
Wash chicken and pat dry. Season the chicken with salt and pepper all over, outside and in the cavity. Put onion and bay leaves in the cavity. Drizzle the chicken with olive oil making sure to cover. Rub the oil into the chicken. Using butcher twine, tightly wrap the legs together and place in a roasting pan on top of a rack. Roast until chicken reaches an internal temperature of 180 degrees. This baking time will usually take 3 hours. Before removing from the oven, cover the chicken with the pesto. Return to the oven and finish baking. Remove from oven and let it rest for at least 15 minutes before cutting. 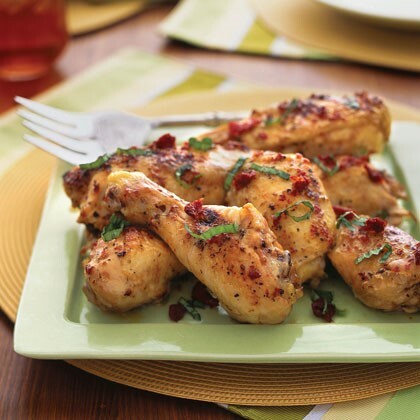 Place chicken pieces on serving platter and add more pesto to the chicken pieces for presentation and flavor. Serve with your favorite vegetables and salad and enjoy.